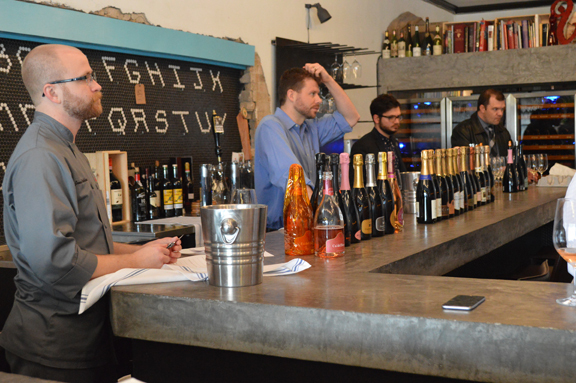 More than 30 wine professionals attended yesterday’s Franciacorta “Real Story” tasting hosted by the Houston Sommelier Association at Camerata at Paulie’s, one of the city’s top wine bars and a favorite among trade members. There were four “advanced” sommeliers in attendance. From left, above, James Watkins, David Keck, Travis Hinkle, and Ben Roberts. Each of them is poised to join the Court of Master Sommeliers. Keck, co-owner of Camerata, and Roberts are the founders of the group, which hosts seminars, tastings, and study groups on a weekly and bi-weekly basis. It’s always a great opportunity to talk to a group of top wine professionals like the members of the Houston Sommelier Association. 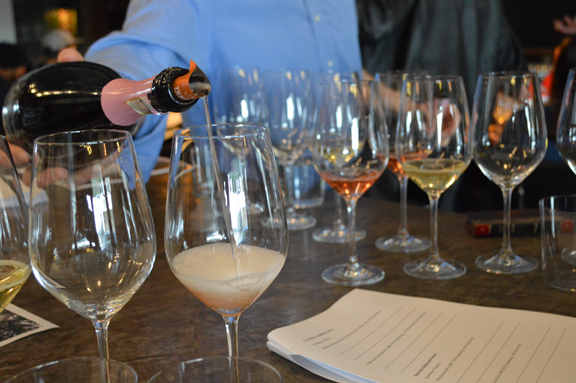 They already know how sparkling wine is made and they have a lot of experience in tasting. Aside from the history of the appellation, its origins, how it got its name, and the major players who have built the Franciacorta “brand,” I spoke at length on Franciacorta’s unique geography, topography, and geology. And I also spent a lot of time discussing residual sugar and dosage and the roles that they play in making Franciacorta such a distinct wine in the sparkling panorama. 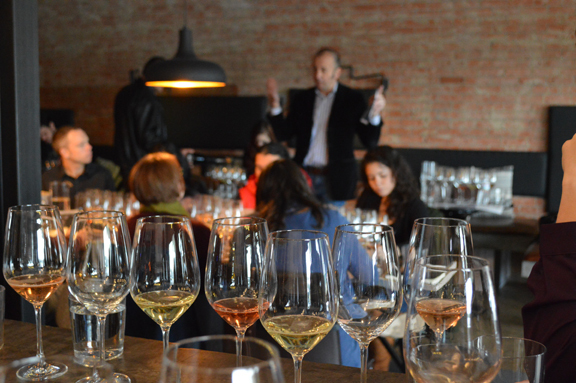 Many of the attendees — most of whom had never tasted much Franciacorta — noted the rich, vibrant fruit character of the wines. There was a lively discussion on dosage and how Franciacorta stands apart in the broad spectrum of sparkling wine production. Happily, none of the bottles were corked: I’m currently working with an Austin venue on a date for a mini-version of the tasting using the reserve bottles that weren’t opened yesterday. Stay tuned! And a HUGE THANKS to the Houston Sommelier Association for hosting this extraordinary tasting.